"For the first time, we have clearly established a 'genetic difference' between stars in the disc and the bulge of our Galaxy," said Manuela Zoccali, lead author of the paper presenting the results in the journal Astronomy and Astrophysics . "We infer from this that the bulge must have formed more rapidly than the disc, probably in less than a billion years and when the Universe was still very young." The Milky Way is a spiral galaxy, having pinwheel-shaped arms of gas, dust, and stars lying in a flattened disc, and extending directly out from a spherical nucleus of stars in the central region. The spherical nucleus is called a bulge, because it bulges out from the disc. While the disc of our Galaxy is made up of stars of all ages, the bulge contains old stars dating from the time the galaxy formed, more than 10 billion years ago. Thus, studying the bulge allows astronomers to know more about how our Galaxy formed. To do this, an international team of astronomers  analysed in detail the chemical composition of 50 giant stars in four different areas of the sky towards the Galactic bulge. They made use of the FLAMES/UVES spectrograph on ESO's Very Large Telescope to obtain high-resolution spectra. The chemical composition of stars carries the signature of the enrichment processes undergone by the interstellar matter up to the moment of their formation. It depends on the previous history of star formation and can thus be used to infer whether there is a 'genetic link' between different stellar groups. 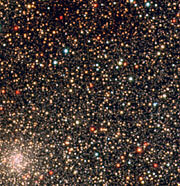 In particular, comparison between the abundance of oxygen and iron in stars is very illustrative. Oxygen is predominantly produced in the explosion of massive, short-lived stars (so-called Type II supernovae), while iron instead originates mostly in Type Ia supernovae , which can take much longer to develop. Comparing oxygen with iron abundances therefore gives insight on the star birth rate in the Milky Way's past. "The larger size and iron-content coverage of our sample allows us to draw much more robust conclusions than were possible until now," said Aurelie Lecureur, from the Paris-Meudon Observatory (France) and co-author of the paper. 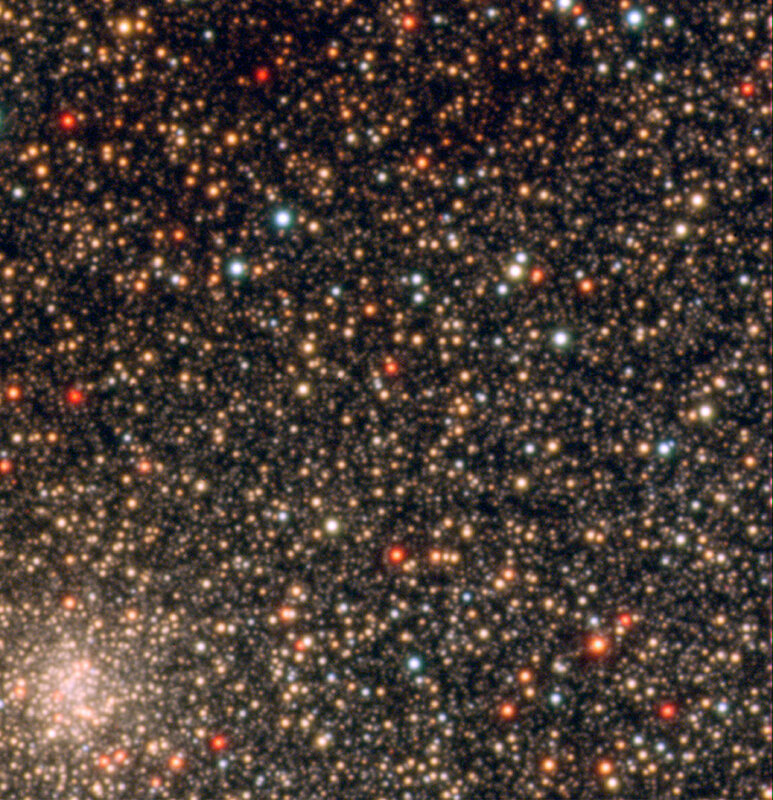 The astronomers clearly established that, for a given iron content, stars in the bulge possess more oxygen than their disc counterparts. This highlights a systematic, hereditary difference between bulge and disc stars. "In other words, bulge stars did not originate in the disc and then migrate inward to build up the bulge but rather formed independently of the disc," said Zoccali. "Moreover, the chemical enrichment of the bulge, and hence its formation timescale, has been faster than that of the disc. Comparisons with theoretical models indicate that the Galactic bulge must have formed in less than a billion years, most likely through a series of starbursts when the Universe was still very young. : "Oxygen abundances in the Galactic bulge: evidence for fast chemical enrichment" by Zoccali et al. It is freely available from the publisher's website as a PDF file. : The team is composed of Manuela Zoccali and Dante Minniti (Universidad Catolica de Chile, Santiago), Aurelie Lecureur, Vanessa Hill and Ana Gomez (Observatoire de Paris-Meudon, France), Beatriz Barbuy (Universidade de Sao Paulo, Brazil), Alvio Renzini (INAF-Osservatorio Astronomico di Padova, Italy), and Yazan Momany and Sergio Ortolani (Universita di Padova, Italy). : Type Ia supernovae are a sub-class of supernovae that were historically classified as not showing the signature of hydrogen in their spectra. They are currently interpreted as the disruption of small, compact stars, called white dwarfs, that acquire matter from a companion star. A white dwarf represents the penultimate stage of a solar-type star. The nuclear reactor in its core has run out of fuel a long time ago and is now inactive. However, at some point the mounting weight of the accumulating material will have increased the pressure inside the white dwarf so much that the nuclear ashes in there will ignite and start burning into even heavier elements. This process very quickly becomes uncontrolled and the entire star is blown to pieces in a dramatic event. An extremely hot fireball is seen that often outshines the host galaxy.